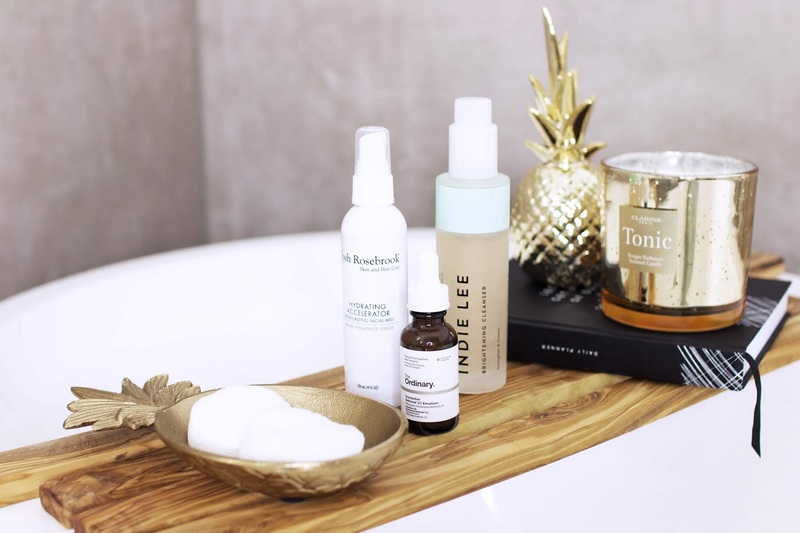 Recently I've been changing up my skincare routine a lot, not just because of the chance in the weather now that were stuck in winter for good, but also because I spent a lot of hours researching skincare ingredients that are being used in most of my skincare products. To be honest, I was absolutely shocked at the amount of harmful ingredients found in a lot of products that I had been using almost every day. I would describe my skin type as quite oily but also dehydrated and prone to clogged pores. Sounds wonderful now that I'm typing it down, doesn't it? 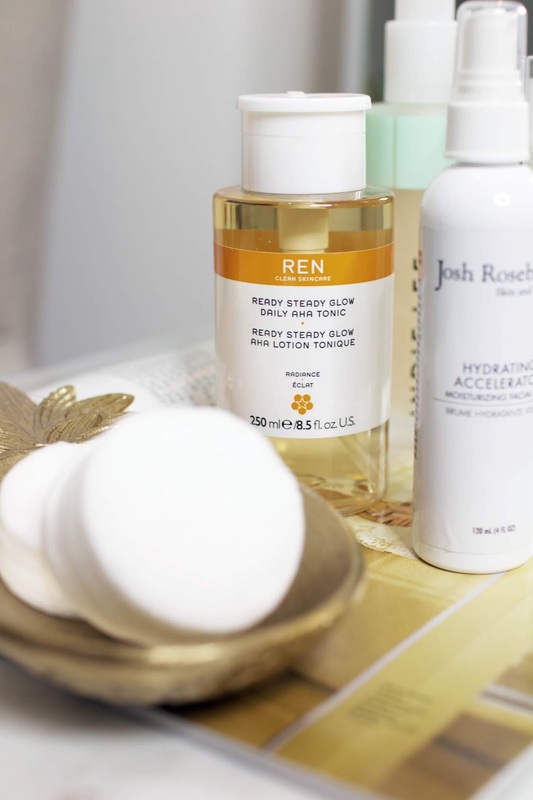 However, the products I had been using before were actually kind of counterproductive for my skin type as I found out by taking a closer look at the ingredients. There's a massive list that I found online of ingredients that will clog your pores besides the usual silicones, which I had never even heard of before. If you guys want to see a more in depth blog post about this topic concerning skincare ingredients to avoid do let me know in the comments and I will be happy to write that for you. Today's post however is all about the products I'm using right now which have completely transformed my skin. All of the products are safe to use for anyone with my skin type and I can highly recommend them to you. Read on to find out everything about my healthy skincare routine. When it comes to skincare, there's one YouTuber I will always rely on and that girl is Annie Jeffrey. If you haven't already go check out her channel for all things health, beauty and skincare. I adore her positive vibes and she always offers the best skincare advice. Thanks to her recommendation, I found out more about the brand Indie Lee, which is an amazing, all natural skincare brand. I started using the Brightening Cleanser and it made all the difference. During winter, my skin often feels very dry, however this cleanser gives your skin the most flawless, fresh-faced look and it's even gentle enough to remove eye makeup. I always look forward to using this cleanser in the morning because it has a gel formula that feels very cooling and is the perfect way to wake up a tired face. The strawberry-infused scent is also incredible. Sticking to cleansers and makeup removers, I like to switch between two products to remove my makeup in the evening. I find that the quickest way to break down all traces of makeup is to use an oil and currently I'm loving the Caudalie Makeup Removing Cleansing Oil. Firstly, I absolutely adore the scent of this, to me it smells like marzipan and it only has a couple of ingredients in it. This oil helps to dissolve your makeup within seconds while also nourishing the skin. Another trusty makeup remover is the Caudalie Micellar Cleansing Water. I feel like micellar waters are the lazy girls way of removing makeup and I'm all for it. This one is a must-have for me and since I've decided to not use the cheaper alternatives from the drugstore anymore, due to the ingredients, I can't rave about this water enough. The next step in my skincare routine is using a toner. Because of my skin type, I like to use a toner that also acts as a light exfoliant. 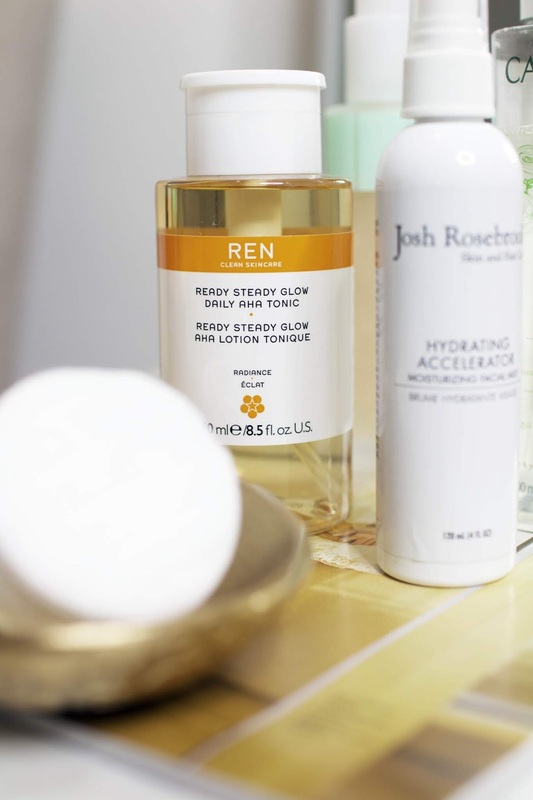 I usually apply a few drops of the Ren Ready Steady Glow Daily AHA Tonic to a cotton pad and smooth it all over my face. This liquid is gentle enough to use daily and helps to brighten your skin. My skin feels incredibly smooth afterwards and I also like that it aims to reduce pore size and evens out the complexion for a beautiful glow. Moving on to moisturizers, I have to say that it was extremely hard to find an all natural moisturizer that doesn't contain any nasty ingredients or ingredients that will clog up my pores. I've finally decided on the Sunday Riley Tidal Brightening Enzyme Water Cream and I'm actually really happy with my choice. This gel-cream feels incredibly lightweight and sinks into the skin very quickly. It contains two weights of hyaluronic acid, alongside resurfacing papaya enzymes and brightening white bird of paradise extract. You only need a tiny bit of product to give your skin the much-needed moisture to smooth, plump and restore dewiness. 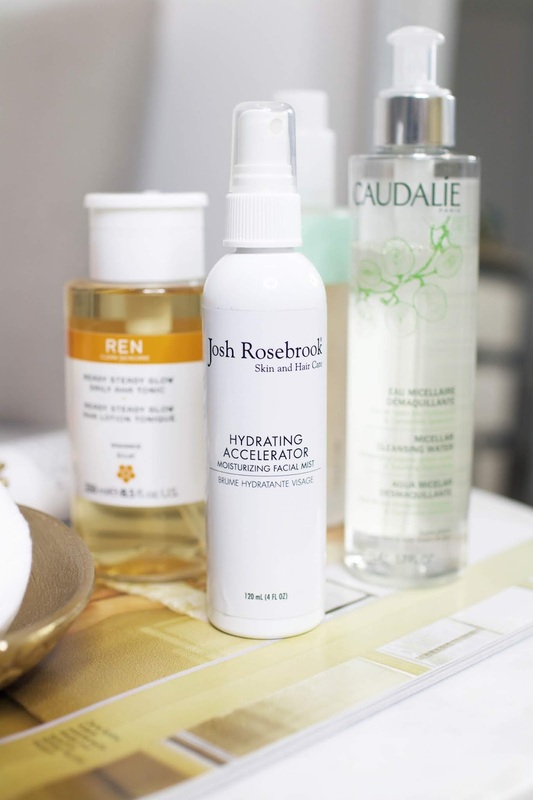 Alongside this moisturizer, I also like to spritz the Josh Rosebrook Hydrating Accelerator all over my face. This product is essentially a hydrator, toner and light moisturizer all in one. This water is infused with vitamins and aloe to lower surface tension and to enhance the delivery of hydration and active nutrients into the skin. This little bottle is filled to the brim with moisturising, soothing natural ingredients that will enhance the performance of other products such as masks, serums and creams. Once a week, I also like to do a face mask and I usually switch between sheet masks or a more powerful exfoliant like the AHA 30% + BHA 2% Peeling Solution from The Ordinary. This lotion has a bright red colour and tingles a little bit on the skin once applied. Alpha hydroxyl acids exfoliate the skin’s topmost layer for a brighter, more even appearance, while beta hydroxyl acids exfoliate the skin more deeply to clear pore congestion. I usually leave it on for 10 minutes before rinsing it off with cold water. Another product from The Ordinary that I can highly recommend is their Granactive Retinoid 2% Emulsion. I use this serum before applying my moisturizer in the evening as it targets fine lines, wrinkles and uneven skin tone. I'm almost done with this bottle and I will definitely repurchase. That's it for my current skincare routine. I know this seems like a lot of products but I can honestly recommend every single one to you guys. Let me know if you have tried any of these products in the comments below.